Another release from yours truly! Yesssss ~ ! I love Fujiko and her romance with Hanazono is totally overshadowing anything in Yawara’s lovelife at this point…. Thanks Saizen & co. for another episode! Top screencap btw… I love the character design in this show… I really need to check out some of Naoki Urasawa’s manga. What! You’ve never read anything else by Urasawa? Start with Monster, then 20th Century Boys, 21st Century Boys, Pluto, and then Billy Bat (currently being written). They’re in the order he wrote them, and I think you really need to understand his style of writing (which is easier to get into with Monster) reading the rest. He really did monster, Skr? 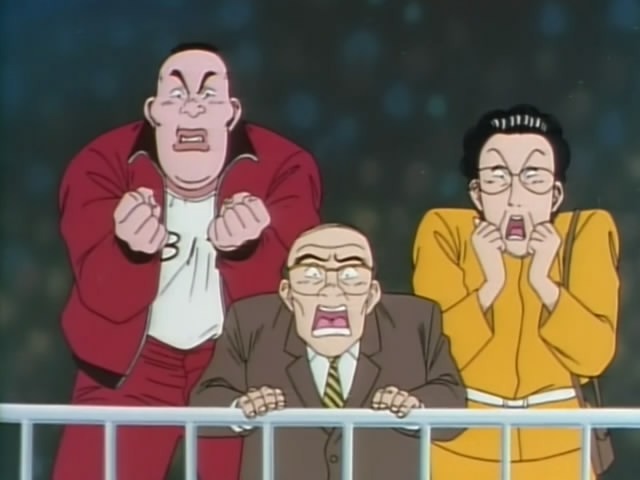 Naoki Urasawa also made Happy another sports manga this time tennis.Never animated. And Master Keaton a episodic series. At first he was just doing the art and someone else the story but he pitched ideas. According to a interview he eventually did the story as well and the other guy didn’t do anything really. This does have a anime series. Also a somewhat short series Pineapple Army. Yawara was a success and basically giving him experience for being a manga creator but stuff like Monster was the type of manga he wanted to create to begin with he said in a interview he held onto the Monster story idea for 10 years before he actually got to start making it in December 1994. Urasawa says his goal to eventually make a series that’s better than Osamu Tezuka’s Phoenix but he’s says he still hasn’t and he’s not sure if he can. Thank you for another release. Monster is number 2 on my all-time favorite anime-list. Thank you for this fan sub! Just stumbled upon the series so I’m very happy that you guys are working on it.